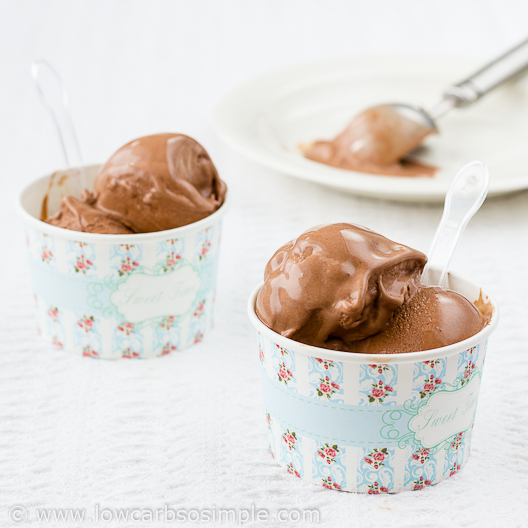 Sinfully Scrumptious Chocolate Ice Cream | Low-Carb, So Simple! So, this sinful tasting ice cream is also sinfully easy to make! Just combine all ingredients, mix well and pour into ice cream maker. …and an optional pinch of salt. It’s not an absolute must, but it gives nice balance and rounds the flavors (and also adds to that sinful taste!). Mix well first with spoon. This is just to prevent the powdery ingredients flying around in your kitchen. Believe me, they would spread all over if you used the electric mixer in the very beginning. Then, take the electric mixer and mix until smooth. This takes just a half a minute or so. Pour the mixture into your ice cream maker and let churn according to the manufacturer’s instructions. I have an ages old ice cream maker, but since it seems to work fine, I didn’t have the need to buy a new one, though I dream of a proper ice cream maker with compressor and stuff. Now the mixture has been churning for 20 minutes. 20 minutes more and it’s ready! Now it’s soft ice consistency, so I would place the ice cream in the freezer for a while. Place all ingredients in a deep and narrow bowl. Stir first with spoon, then mix with an electric mixer until well mixed. Pour into the ice cream maker and let churn according to the manufacturer's instructions. Now I have to confess something: As I always try to find shortcuts and simplify things, I don’t want to spend time for any cooking when preparing ice cream. I rather search for easy methods where all you need is just to mix the ingredients and let the ice cream maker take care of the rest. Naturally, I don’t want to sacrifice anything while simplifying things, but create an ultimate ice cream experience where texture and taste are the best possible ones. I did lots of experiments with this ice cream until I found the right ingredients and right amounts. I’ve made lots of ice cream flavors, but this time wanted to create a perfect recipe for simple chocolate ice cream. In my very first experiments I used sour cream (or actually crème fraîche) in addition to heavy cream, however it wasn’t a perfect match with chocolate. The ice cream was simply too bitter. In vanilla ice cream sour cream gives a perfect touch and some edge, but with this chocolate ice cream it was just spoiling things. Somehow I was thinking of adding eggs. First of all, they would be really nourishing. Since I didn’t want to do any cooking, I decided to try out how the ice cream will turn out with raw eggs. I was actually pretty skeptical and thought that heavy cream and raw eggs together will just create icy and flaky mass, but the result was surprisingly good! The texture was smooth and exactly like soft ice. The flavor was fine, but I had to use more cocoa powder and more sweetener to make it even better. Vanilla extract was a must. Without it the flavor was simply too bland. From my 3-ingredient 5-minute ice cream experiments I knew that salt would be a perfect addition to sweet ice cream. Sometimes when making the 5-minute ice cream, the plastic bag broke and you got some salt to the ice cream. Then I realized that salt has much to give to the taste (as long as you don’t add too much!) and I have often added salt when making any ice cream flavor. After a few more adjustments I was satisfied with the result. Both the texture and the flavor were oh-so-heavenly divine! First of all, if you are not comfortable with raw eggs, you can use pasteurized eggs, or a combination of powdered eggs and water. Even better idea is to replace the water with heavy cream. You can also make this recipe easily dairy-free by replacing the heavy cream with coconut milk. If you consider the aftertaste of the sweetener too strong, you can combine different sweeteners for minimizing the side tastes and maximizing the sweetness. For example, you can use stevia glycerite together with Swerve. Note that this recipe makes quite a small amount of ice cream. I just needed to adjust it to my ice cream maker. I recommend to adjust the amount to fit to your ice cream maker. I used 2 egg yolks instead of whole eggs, this should not have affect on the net carbs, only the protein. Any thoughts?? Which cream did you use? The carb count also depends on the brand. So happy to hear you all liked it!! I will be making this tonight! I want it to last about 5 days, does it triple okay? When stored in the freezer until next day, does it get stone hard? I read somewhere how some people add a tablespoon of vodka to their homemade ice-cream so it doesn’t get so hard when in the freezer. What do you think about that? Caramel vodka sounds great, never heard of that before! Just made this in my new Cuisinart ICE-21. I made this as it was the only non-cook low carb chocolate ice cream recipe I could find. I made it exactly according to the recipe except I used Hershey’s Special Dark cocoa and I doubled it. Took 20 min in my machine. And I must say – this ice cream is AMAZING! It should not be so good! I will want to make it too often. Thank you so much for developing the recipe and sharing it. Hi Shelley! Wow, so great you liked it! It’s one of my family favorites, too! Just made this recipe (doubled) and added about a 1/4 tsp of xanthum gum and about a tablespoon of coconut oil. I was DELICIOUS! I cannot believe it was low carb!!!! I am so glad I doubled this recipe. So delicious!!! Can’t wait to try your other recipes. I just made this and it’s absolutely fabulous! Thanks for sharing. It tastes decadent…but it’s good for you! This is going to be a regular dessert at our house. Hi Lori, so great to hear you liked it! Actually, I made it today, too, it’s one of the staples in my family! Decorated with whipped cream and crushed salted peanuts, it tastes even more sinful…! What is the serving size of the recipe? How many calories are in it? Any ideas for if I don’t have a icecream maker??? Hi Ella, you can freeze the mixture and stir it properly every half an hour or hour, until the consistency is to your liking. Just made this and it was great! Chocolate ice cream is one of my favorite things, so this’s will keep me on track! Thank you! Sounds delicious – I make a similar chocolate ice cream that doesn’t use eggs at all – just half and half, and heavy cream, cocoa powder, swerve, vanilla extract and 1 TBSP of MCT oil, and 1/4 tsp guar gum, pinch of salt. Just like this but no eggs. I’m wondering why things have to be described as sinful to be desirable? Amazing! Thank you for the recipe. We had the chocolate now we are making vanilla! You’re very welcome! So great to hear that you liked it! This is the best low carb ice cream. I make often. My husband loves it too and he is not low carb. Thank you!! So great to hear, Christine! So, so good. So, so easy- thank you!!! Thia recipe sounds amazing Elvira! If I want to do a plain vanila ice cream, would just leaving out the cocoa powder work? Or would I have to make additional adjustments to the recipe? Looks divine. Would four or five yolks work in lieu of the 2 whole raw eggs? Thanks, JB! Yes, yolks should work perfectly. This is churning in the ice cream maker right now, but I have to say that I snuck a bit of the frozen part with a spoon and it’s amazing. Best low carb ice cream ever. And since I have chickens, I’m gonna be making this a lot. Thank YOU!! Hi Brenda! So great to hear that you like it! It’s very likely that it doesn’t dissolve properly and feels “gritty”. Powdering it with food processor solves the problem.